Whereas regulation of the MLM sector came mostly to a standstill thanks to Trump’s shutdown, in some corners government employees are still active. One such corner is the Washington state AG’s Office, who are suing LuLaRoe for being a pyramid scheme. Named defendants in the AG’s lawsuit are LuLaRoe and owners Mark Stidham and DeAnne Brady (right). Jordan Brady, cited as “a Leadership and Culture Development role at LuLaRoe”, is also a named-defendant. LuLaRoe operated an unlawful pyramid scheme in the State of Washington. until July 1, 2017, … gave Consultants a right to receive compensation entirely based on the recruitment of other persons as participants in the LuLaRoe MLM. In other words, your classic MLM autoship recruitment scheme. This regulatory non-compliant model sees affiliates of an MLM company typically sign up with some sort of package. By way of a monthly product order affiliates are either required to or continue to pay a monthly fee to maintain the status quo. Commissions are then earned when others are recruited who also sign up and pay monthly autoship fees. In LuLaRoe this was referred to as the Leadership Bonus. Income earned through the Leadership Bonus Plan significantly dwarfed retail profits for top consultants. At a Leadership Conference themed, `Be the Light” hosted at the Riverside Convention Center in California in January 2017; Defendant Brady asked Consultants to publicly state their last month’s total retail sales and bonus checks. Compared to their monthly retail sales, which ranged from $12,000 to $25,000, it was clear that the primary opportunity for compensation was not through sale of LuLaRoe apparel, but bonuses earned through recruiting. Shortly after this convention, ‘LuLaRoe revised their Leadership Bonus Plan to compensate Consultants based on actual retail sales rather than inventory purchases‘. In other words, LuLaRoe moved away from having a compensation structure that primarily rewarded Consultants based on recruiting towards a compensation structure based on bona fide retail sales to consumers. After four years of running a pyramid scheme however, LuLaRoe’s compensation changes were evidently too little too late. an easy path to financial freedom and independence … (through a) process” to sell merchandise (that) emphasized recruiting. LuLaRoe’s affiliate Policies and Procedures prohibit income claims. Defendant Brady led panels and asked top Consultants present their Leadership bonus checks publicly, which were much larger than the amount of profits earned from retail sales. 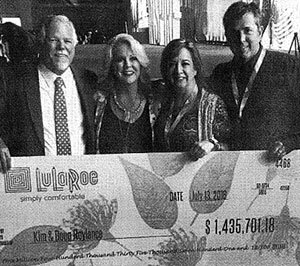 On July 13, 2015, Defendants Stidham and Brady publicly presented a Consultant and her husband an oversized bonus check at VISION Leadership Conference in the amount of $1,425,701.18, creating the impression that other Consultants could also achieve such income through the LuLaRoe Program. Defendants Stidham and Brady posed with the Consultants for a photo with the check, which was then posted on a Consultant’s blog site designed to recruit additional Consultants. Rather than acknowledge the bulk of commissions paid out are tied to recruitment, LuLaRoe instead implied ‘negative results are due to the inadequate efforts of the Consultant‘. Furthermore when business inevitably declined following the 2017 compensation plan changes, LuLaRoe stopped updating their annual Income Statement. The Washington AG cites this as evidence of LuLaRoe keeping “material information” from “prospective Consultants”. In BehindMLM’s own June 2018 LuLaRoe review, we labelled the MLM opportunity a “lucky leggings lottery”. With no control over what patterns they receive, LuLaRoe affiliates are going to be left with inventory they can’t move. When we’re talking a five thousand minimum buy into the business however – affiliates buying what they can’t sell or use has inventory loading written all over it. Even more so when you consider the spiral some LuLaRoe affiliates might find themselves in if they keep buying inventory lottery tickets in the hope of receiving sellable product (perceived or otherwise). Inventory loading was also key criticism in the Washington AG’s lawsuit. LaRoe also engages in a number of practices that encourage Consultants to purchase significant wholesale inventory, further reinforcing the pyramid scheme. In addition to the unlawful Leadership Bonus Plan, LuLaRoe engaged in unfair and deceptive business practices that encourage inventory loading. Such practices include educating Consultants that a key to success is maintaining significant inventory; not permitting Consultants to pick the pattern or size of apparel included in inventory purchases; minimum monthly inventory purchase requirements to stay “active” or qualify for the Leadership Bonus Plan; and marketing limited 22 edition “unicorn” pieces to create a “frenzy” of inventory ordering. Allegedly LuLaRoe represented to prospective consultants that ‘they could recoup most of their investment in the LuLaRoe Program if the opportunity did not work out for them‘. When LuLaRoe affiliates were inevitably saddled with a ton of purchased inventory they couldn’t sell, they instead had to contend with ‘a very complex process for initiating a refund‘. That process essentially saw LuLaRoe defraud affiliates out of refunds. In April 25, 2017, in response to market saturation and a growing number of “G.O.O.B” or “Going Out of Business” sales, LuLaRoe announced it would be changing its 90% policy to 100%, and committed to paying for return shipping. LuLaRoe made representations that the revised 100% policy would not go away. However, without any advance notice to Consultants, LuLaRoe announced 17 on September 13, 2017, that it would no longer honor its 100% refund policy. Following the announcement, many retailers who had started the exit process experienced issues with their refunds, including a lack of response to initiating refunds, delays in sending formstacks, miscalculations in the amount of refunds owed (which became known among Consultants as “LuLaMath”), and significantly delayed or non-payment of refunds. Word spread quickly amongst LuLaRoe Consultants about LuLaRoe’s failure to honor the repurchase policy. As a result of LuLaRoe’s failure to honor its written repurchase policy, many Consultants who initiated a cancellation did not send in their merchandise because they believed LuLaRoe would not refund them the appropriate amount, if at all. or donating merchandise at a loss. Many others are still holding onto boxes of unsaleable inventory. All in all, the Washington AG alleges LuLaRoe’s pyramid scheme caused “harm to Washingtonians and the public interest”. LuLaRoe’s business model was a pyramid scheme. The primary business opportunity in the LuLaRoe MLM was its Leadership Bonus Plan, which until July 2017, rewarded compensation solely based on recruiting and inventory purchases. Further, LuLaRoe’s marketing and sales activities, misleading income and lifestyle claims, emphasis on recruiting and inventory purchases over emphasis on sales to consumers outside the LuLaRoe organization, and inventory loading practices ensured that the primary business opportunity with LuLaRoe was through recruitment. Defendants market the LuLaRoe MLM as a transformational, empowering opportunity to achieve dreams and achieve financial freedom while providing a flexible and part time alternative to traditional employment. LuLaRoe’s marketing prominently features testimonials of independent, stylish, affluent women who have it all: a successful career flexibility and time to spend with their children, and a harmonious marriage. In reality, LuLaRoe’s pyramid scheme business model and compensation plan, and its corresponding marketing activities dictated that during any particular time, a majority of Washington Consultants lost money. providing affiliates with means and instrumentalities to violate the Consumer Protection Act. The lawsuit was filed on January 23rd. As at the time of publication LuLaRoe has yet to issue a public response. Unfortunately this isn’t a case I can track on Pacer, but we’ll do our best to keep you updated on developments. Mary Kay also does not track retail sales but rather rewards upline via downline consultant purchases. The same exact thing LuLaRoe did. And why would they track consultant sales anyway? The products are already sold by the company to consultants and charged tax. They are the true customers. Any money made selling product at double retail goes to the consultant. Unfortunately, no easy task when the company promotes recruiting your own customers to infinity for profit, and product is easily obtained at regular retail (consultant price). MLM is inherently flawed. Yawn.